It is very important that online teachers be able to recognize the valuable aspects of nonverbal communication and to detect the early signs that may indicate a lack of interest by the students. The first “symptoms” of distraction can be seen in the pupils’ body language, gestures, posture, etc. If read correctly and on time, these symptoms can serve as an indication or precaution for teachers. Properly dealing with this issue is very important for the efficient and effective delivery of instruction in the virtual classroom. The word “interest” can have many meanings. But when it comes to education, it can be described as the desire of both the students and teachers to be a part of the learning process. Interest as a noun means: the feeling of wanting to give your attention to something or of wanting to be involved with and to discover more about something. The absence of interest is among the greatest challenges that tutors face in their daily work. Properly conducting a learning session, especially in an online environment, requires the attention of all of the participants. Overcoming this obstacle is extremely difficult because the lack of interest may be due to various reasons. Nevertheless, a major tool that can assist teachers is nonverbal communication. The specific signs and cues that can help the tutor recognize a lack of interest in students in the virtual classroom include facial expressions, gestures, the power of the voice, body language and posture, eye contact, and appearance. However, not all aspects of nonverbal behavior can be examined in the virtual classroom as is possible in face-to-face communication. Some things are specific to the online environment. For example, it should be considered that out of all of the possible types of body language signals, only those that are made with the upper part of the body are applicable. This is a result of the fact that contact in virtual classrooms is mediated via cameras. Often the main focus is placed on the participant’s face or both their face and upper body. Therefore the movements of the lower body are not transmitted and remain invisible to the tutor. Teachers can overcome the difficulty of having only partial cues of nonverbal communication by closely examining the cues that they do have. In the virtual classroom, as well as in any conventional classroom, it is very important for tutors to observe the behavior of their pupils. Body position can say a lot – whether the students are facing the teacher or not, whether they are crossing their arms or not, whether they are turning their head away, etc. Here are some of the major signs that a teacher can detect in the virtual classroom. The normal state, which conveys calmness and openness, is having one’s hands open with the palms facing the counterpart. “Closed” gestures, which indicate a lack of interest, involve the use of the arms (e.g., arm crossing) or other objects in order to create a barrier. Even though a lot of people, including students and teachers, claim to feel comfortable having their arms crossed in front of their chest, this body position usually expresses a desire to distance oneself from an unpleasant topic, conversation, or person. Another gesture showing the desire to “close” oneself off is hand clenching. Like other negative gestures, this one also shows that the pupil does not feel comfortable in some way. In a modified version the clenching could be accompanied by the use of an object, such as a pen or pencil. In this case the object is often held between both hands and is pointed at the person who is speaking. This is a hostile and aggressive gesture. It sends a message of disapproval and the suppressed desire to “attack” or even to “destroy” what is being said or discussed. Besides hand gestures, teachers should be conscious of the gaze of their pupils, which can indicate a fading interest level. People tend to keep their focus longer when they are interested and motivated. A gaze that lacks interest, however, wanders, explores its surroundings, and seeks something more exciting. Teachers must bear in mind that facial expressions such as eye rolling convey a strong message of disagreement and not necessarily a lack of interest. Moreover, after a couple of eye rolls the pupil may be willing to verbally agree or disagree – whichever the case requires – in order to move on from the topic at hand. The eyes are framed by the eyebrows and together they form a significant part of a facial expression. 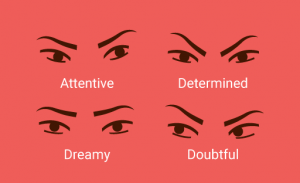 Often, a slight change in the eyebrows can result in an entirely different look and can completely change one’s gaze. 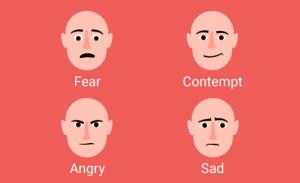 According to Paul Ekman there are universal emotions that are easily recognizable all over the world such as contempt, disgust, happiness, fear, sadness, surprise, and anger. Teachers can use the information conveyed by the faces of their students to learn whether the students are understanding the material well enough, whether they are exhausted, etc. For example, smiling is the natural reaction of people when they are pleased or happy and when they have a postive attitude towards other people. In the virtual classroom the smiles of pupils can encourage tutors to proceed in the manner in which they have begun. The effect of a nod is relatively the same. Nods indicate interest while the sideways shake of the head expresses disagreement. The lack of smiles and nods could be read as a concerning nonverbal cue of disinterest. The pace of speech can be perceived in a similar way. When students begin to speak very slowly, it often means they are trying to buy more time. That is usually due to the fact that they got distracted over the course of the learning process. There are many small signs which, when considered separately, do not indicate a lack of interest. But often a group of such cues manifested together signals disinterest. Examples of this include frequently checking a cell phone, constantly looking around, looking at the clock, yawning, eye rubbing, as well as all other things that can create a distraction from the learning session.